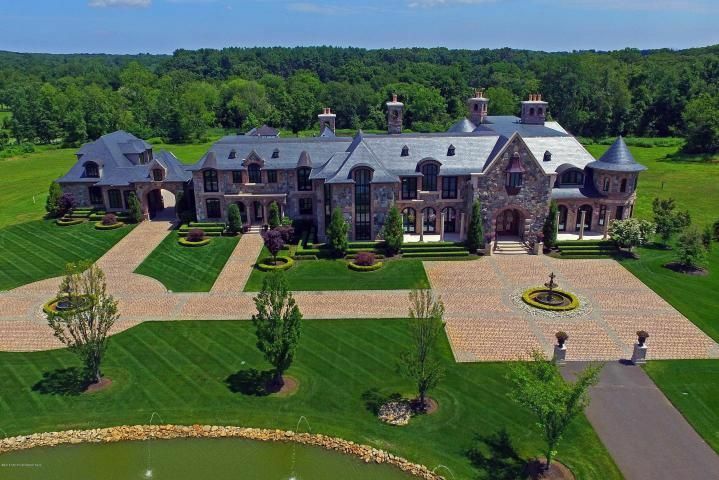 Welcome to “Abbey Farm”, One of Colts Neck’s most magnificent Stone Mansions that exudes Elegance, Majesty, Symmetry & Authenticity. The focal point of this 28 acre parcel is the 18,000+ square-foot European Style Chateau. It is the realization of the owners’ dream and was inspired by the French castles of Europe. The vision was brought to life and filled with breathe-taking light-filled spaces arranged for extravagant entertaining and inspired aesthetic daily living and contemplation. This gated residence, located on one of the most coveted streets in town, allows entry through the winding driveway, bordering 3 awe inspiring ponds and fountains, leading to a masterpiece that is magnificent in scale and unstinting in luxury. The property was created for living and entertaining on a grand scale, yet it is welcoming warm and comfortable for everyday living. Guests are welcomed through a magnificent entrance hall that leads to a breathtaking double helix spiral staircase that is the centerpiece of the home. An entertainer's dream-come-true, the home includes a palatial grand room that can easily accommodate over 150 guests. 8 fireplaces, elaborate Crown Mouldings, French Doors, a wall of windows, 2 custom furniture quality kitchens, courtyard and separate guest cottage are just some of the features in this 6 bedroom 10 bath home. The list is too extensive and must be seen to appreciate. Do not miss out on previewing this architectural masterpiece.